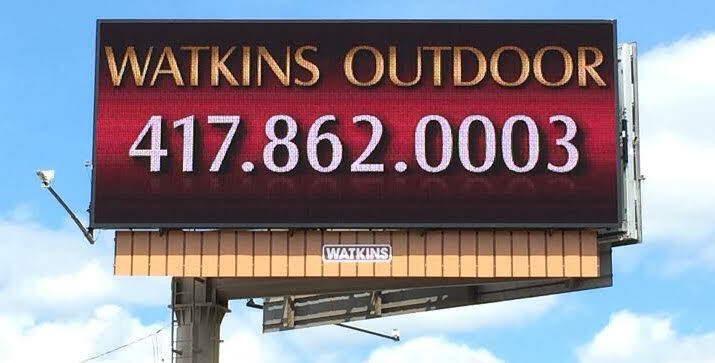 Family owned since 1998, Watkins Outdoor Advertising has been dedicated to bringing the highest quality service and visuals to the Ozarks that is sure to get your message across. Each billboard is at key intersections and high traffic areas with at least one stop light for increased viewing time. All are on newer single poles that are angled slightly to optimize the view and readability of each board. In need of a printer? Our customers can buy vinyl directly from Independent’s Printing located in Hannibal, MO: 12oz black-backed flex vinyl printed on a new UV printer, using UV ink for 58¢ per square foot with free shipping. Interested in pricing for our digital boards? Visit our Rate Card page to learn more or call 417-844-1098 for more information. Want to maximize your reach to Springfield community? Check out our Rotary plan. Select the 5 locations you like best, then we use 4 of those 5 and move you to each of these throughout the year. You provide the art/designs at the correct pixel size for each selected billboard; we do the rest. No production charges and no installation charges ever! We have locations on Glenstone & Primrose, Sunshine & Grant, National & Trafficway, National & Battlefield, and Campbell (South of James River). For mailing address, please email us!